Disney Magic - magic at sea! The ship designed from the bow to the aft with imagination and love. The Disney Magic was launched in April 1997 and Magic’s maiden voyage embarked on July 30, 1998 from Port Canaveral, Florida. It was built in the Italian Fincatieri’s Ancona shipyard. This ship from Disney Cruise Line operates under the Bahamian flag. At a length of 984 feet it can accommodate a maximum 2,700 passengers and guests are looked after by a crew of 945 members. Disney magic features diverse entertainment, including parties and theme nights, contests and tournaments, music and dance, and other features. The Disney Magic offers a vast range of itineraries, mainly cruising the Caribbean, but this stunning ship will also head off to ports in the Bahamas, Canada and Europe! Experience a whole new relationship to sea and cruise the Caribbean and the Bahamas. Disney’s original cruise ship, the Disney Magic, combines classic Disney charm with modern comforts and technology. This family-friendly cruise ship is guaranteed to be a hit with the kids, but will also delight Disney fans of all ages. Be transported into the wonderful world of Disney through a variety of movie-themed restaurants, clubs and performances, while enjoying cruise ship classics such as on-board pools, live entertainment and fine dining. Young princes and princesses can get a makeover at the kid-friendly Bibbido Bobbidi Boutique while their parents are getting pampered at the Senses Salon & Spa. Adults-only areas such as the semiformal Palo restaurant and hidden lounges and pools throughout the ship give the grown-ups a chance to relax and unwind while the kids are having a blast at one of the ship’s many kid clubs and activities. Whatever your age, a cruise on the Disney Magic is a dream come true. 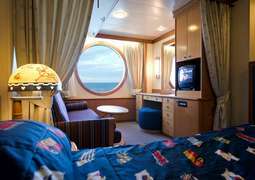 Staterooms on board the Disney Magic are perfectly equipped for a dream cruise vacation with the whole family. A variety of standard and deluxe Interior, Oceanview and spacious Verandah staterooms are available to suite all budgets and needs. For a touch of luxury, select one of Disney Magic’s luxurious Concierge staterooms, which feature large, private verandahs and premium amenities. There is a world of culinary delights to be explored on board the Disney Magic, where a fabulous range of restaurants and dining options await you. From pizza parlors and abundant boardwalk-themed buffets to American-French fusion fare and exclusive adults-only dining options, there is something for every palate and occasion. There are also a variety of lively bars and charming cafés to be enjoyed, in addition to 24-hour room service. Have you ever dreamed of meeting Mickey, Minnie, Pluto and Donald Duck in person? On board the Disney Magic, this is no longer a childhood dream with the opportunity to greet some of Disney’s most loved characters at the on-board kids’ clubs or autograph sessions. Disney literally springs to life on board the Disney Magic, with a host of Disney spectaculars to enjoy at the Walt Disney Theatre and exciting deck parties such as Adventures Away and Pirate Night. There is a variety of fun-filled activities onboard the Disney Magic to keep the whole family entertained. Children and young adults can take advantage of a host of age-appropriate activities, such as Disney’s Oceaneer Club and MARVEL’s Avengers Academy, or Edge and Vibe, special clubs designed just for tweens and teens. The AquaLab, Goofy’s Pool and the AquaDunk make Disney Magic a pool-lover’s paradise. There’s even a Quiet Cove Pool, which as an adults-only retreat is the perfect place to escape the daily grind. Take advantage of a range of fitness and wellness facilities on board the Disney Magic. The fully-equipped onboard gym features state-of-the-art equipment and fitness classes to enjoy against the backdrop of spectacular, sweeping ocean views. Need to relax and unwind? Pay a visit to the Senses Spa & Salon for the ultimate pampering experience. There is no dress code on board the Disney Magic. Feel free to dress as you please. Experience a whole new relationship to sea and cruise the Caribbean and the Bahamas. 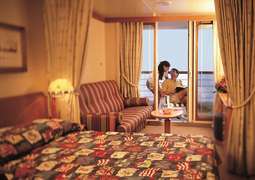 Most cruises last between four and six nights, and you have got a great start to your trip from Miami, Florida or New York, New York. On these cruises you can also discover Disney private island – Castaway Cay. It is an ideal place for snorkeling, scuba diving and open-air massages. You can choose from casual quick snacks or you can dine in more intimate surroundings. The Disney Magic offers 10 eateries, including an adults-only specialty restaurant. A Californian restaurant is available for guests, bringing the spirit of the Pacific Region of the United States to the ship. Cabanas is designed like a casual beach-themed buffet. Palo, the adults-only restaurant, offers sweeping ocean views, elegant décor and sumptuous Italian cuisine. American classics and French food can be enjoyed at Lumiere’s and for some memorable Disney magic head to the Animator’s Palate. 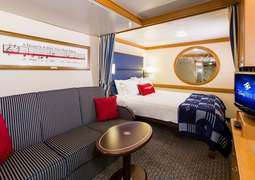 You are guaranteed to find everything you need for a successful cruise in the many styles of staterooms onboard the Disney Magic. Here your stateroom is your own private retreat – a relaxed, family-size getaway, breathe in the ocean air and stretch out in style and comfort. 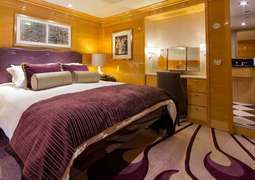 The accommodation of Disney Magic was designed to create the perfect atmosphere for all type of travelers.